Owl I wanna do is have some fun. Being a console gamer, I missed the original release of Owlboy on PC, a game nearly a decade in development and receiving a ton of positive praise and industry recognition. The game has finally made its way to a home console with the Nintendo Switch and frankly, I don't see what all the fuss was about. Owlboy is an average title with some frustrating instant fail mechanics and massive technical problems that make the title not as enjoyable as I think it could have been. The Nintendo Switch is easily the most attractive format for a game like Owlboy. You can play it on the TV, on a commute to work, or even during a lunch break. Owlboy will run you around 10 hours on a standard playthrough and nearly 20 hours should you want to track down every single coin the game has hidden for you. There are also several secrets that look to add more to the detailed lore developer D-Pad Studio has created here and can be quite the challenge to discover it all. Now, you may look at my score first and then read the review or just ignore everything I have written here and assume I just hate the game, but that's not the case. There is a lot to like about this game, but its controls, technical issues and a lack of a map really didn't let me enjoy it as much as I should or could have. I'm a huge fan of platformers and Owlboy has a lot going for it, it just fails to execute on the good ideas that are here. 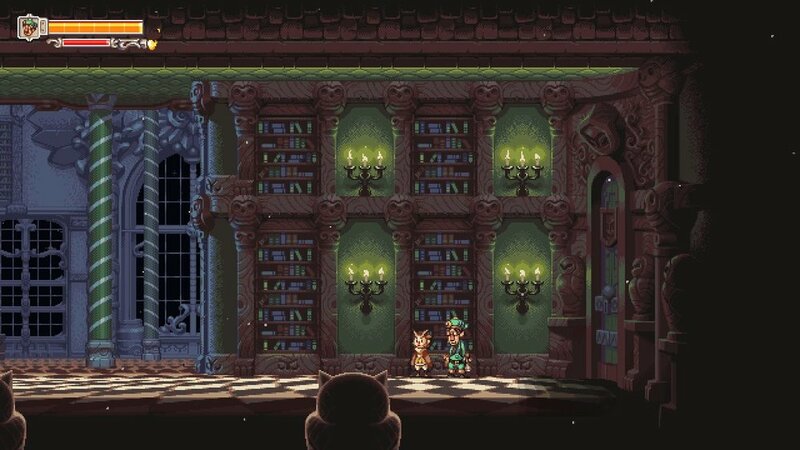 The 16-bit aesthetic works beautifully as Owlboy is a really stunning game visually. Characters have fun animations that set up their personalities and enhance the wonderful designs of not only Otus, your main character, but the various sidekicks that join you on your adventure. These fun designs and character personalities also translate into the wide cast of NPC's that fill the game, especially that of the two characters that run the shop. You can stop and chat with nearly every character and listen to what they have to say, but normally it is them blaming Otus for the problems plaguing the village, which can cause Otus to slouch and look very sad. You are joined by three sidekicks throughout the game, with one of them starting off already as your friend. The last two that join you will initially start out against you until a common foe will align the lot of you and then it's off to get revenge and save each of your homelands. Otus will treat each of these characters as a bullet type weapon as Owlboy is less platformer and more of a bullet hell shooter if I was to describe it plainly. Characters will fire as a standard pistol, shotgun, and another weapon type that would spoil who the final sidekick is. Each character also uses their weapon to bypass certain sections like a typical Metroidvania game. Characters can blast or burn through vines, attach to rings, or shoot down pillars to progress through sections of the level blocked from you. There is even a chase scene that has you put most of these mechanics to the test that works well and can come off as some extremely frantic fun. Owlboy's plot revolves around the search for the long-lost Owl Relic's, items that can grant devastating power. As Otus, you are unofficially tasked with stopping a band of Pirates from obtaining these items. In typical fashion, however; you know full well that the Pirates will collect each of these despite your best efforts. The final battle was surprising shocking as while the game sets you up to face a certain foe, it doesn't exactly go as planned and the wonderful lore that is present here allows for a much better choice in its finale. The game also features a beautiful ending that suits the game well. Otus can fly, dash, roll, and jump, as well as carry each of his sidekicks as you move a cursor around to aim. There are also several enemies and objects that you can carry or throw to tackle certain challenges. Double jumping will trigger your flight as will shooting the weapon type of your carried partner. I had Otus constantly attempt to fly when I would single jump and this caused dozens and dozens of deaths, especially during moments where flying is prevented. The number of times I died during the floating rock section in the late game almost made me quit the game entirely. This is also true of the moments in the game where you need to stealth past instant fail enemies. Any time the game deviated from its joyful platforming aspects proved to be the less engaging parts of the adventure. The controls for Owlboy are not great on the Switch. While I found it to be far better with using the Pro Controller, or the Joycon grip, they don't feel as polished as they should be. 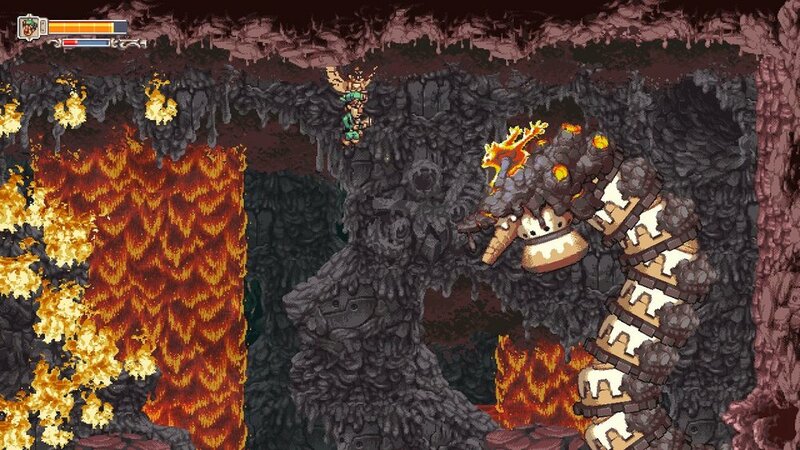 Otus doesn't move or respond that fast and there are many battles where you can lose track of him entirely. My biggest issues are the jumping and flying which doesn't feel fun or fluid and since the entirety of the game is these two mechanics, that can spell certain doom for your overall enjoyment. As I mentioned before, I had several times where my character would fly on a single jump press, or not fly at all. While maneuvering with your partner and aiming can be hectic during a boss encounter, that aspect never seemed to fail me or become something a little practice couldn't fix. There is also a control issue when riding a certain boss through some tunnels as the controls were so bad that I just let the game guide me instead, and wouldn't you know it, it worked. For a world as big and spaced out as Owlboy, I am surprised there is no map of any sort. The number of times I wandered around lost and not knowing where to go was constant and frankly, it can be extremely vague on where to even go most of the time, even when the objective is simply a screen down from you. Had the game had objective markers or a simplistic map, this would have been a quality of life update that would have benefitted the game greatly. My time with Owlboy was completed in a mere two sittings. I played roughly 3 hours in handheld mode and the rest docked. I had the game crash 7-8 times and had to repeat entire boss encounters over and over again. The checkpoint system is ok and while you can skip long cutscenes, there are 10-15 second scripted events that you cannot skip and the number of times I had to sit through them made me hate these little moments with intense passion. Owlboy has a wonderful story, enjoyable characters, well-designed boss battles, and a beautiful ending, Getting to that ending, however; was a hot and cold mess of inconsistency. The traditional platformer aspects are great when the jumping and flying actually works, but the instant fail mechanics took a game that looked amazing and made it frustrating and a slog to get through. There are several great ideas here that ultimately don't pay off. I don't hate the game nor loathe it in any respect, it just doesn't play consistently fun and it's something that I just don't have the desire to revisit anytime soon. owlboy WAS PURCHASED BY THE REVIEWER.